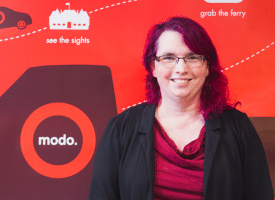 Karen New is the Director of Information Systems at Modo Co-operative, North America’s oldest & largest car co-op, where she oversees the IT infrastructure, software development, business analysis, and location planning. Modo aims to transform communities by connecting people with places in a way that’s affordable, convenient, inclusive and sustainable, and Karen’s work modelling round-trip usage and demand has helped it expand to more than 650 shared cars in 23 municipalities across British Columbia. A former Canadian logic puzzle champion, Karen holds degrees in Physics and English and a diploma in book publishing. She has worked at Modo since 2002. In her spare time she composes madrigals. 1. What were the unexpected developments in shared mobility in 2018? Well I am going to go with development that was not in transportation directly, but in video processing. There’s a research paper that landed in January of last year that showed that it was possible to spoof any automatic image parser, just using a careful collection of curated pixels, basically like an optical illusion for image-based AIs. Between that and the advances being made generating images on the fly, from various descriptions, I think this is going to have a lot of effects that we’re not entirely ready for. I think this is, notably, in the long term, going to completely change the expectations that anybody has about autonomous vehicles. That’s entirely based on being able to parse images very, very quickly – we’ve been using ReCaptcha for years to help train those AIs – but if those can be defeated by a few stray pixels that a human would not notice, and can be defeated systematically, that turns those vehicles back from full autonomy by an enormous degree. I’m not sure that that’s been entirely processed within the ‘hype’ community of autonomous vehicles. At a much more immediate level, most shared mobility services, especially the ones that don’t maintain a significant ground presence (apart from, presumably, fleet teams), use image processing to validate driver’s licenses and to validate identity upon application. That’s been hacked, and I’m not sure that people are entirely grappling with what that means either. 2. What about Electric Vehicles? Are we finally moving towards mass adoption within shared mobility fleets? The first thing I want to do is interrogate the phrase ‘shared mobility.’ The biggest, most successful, powerful, and probably the best shared mobility fleets anywhere, are what is commonly known as public transit. Public transit has been adopting electric vehicles, wholesale, for decades. So I think the key question is not so much ‘how do we get toward mass adoption?’ but, ‘how do the rest of us catch up?’. The biggest constraint is going to be the charging infrastructure. It has been really well answered for, for personally owned electric vehicles. You can charge your vehicle overnight with either a level 1 or 2 charger in your condo’s parking garage. You can even run an extension cord out from your house. It has not been terribly well answered for shared mobility fleets, and that gets very quickly into a land use question. How it affects shared mobility fleets depends on what kind of shared mobility fleet you’re looking at. Notably, is this the sort that has significant fleet staff, or, indeed, significant drivers that act as fleet staff, who take personal responsibility for the cars, and who also take personal responsibility for the fueling? In those sorts of models, there’s no constraint against EV sharing anymore than there is for the personally owned vehicle. So that’s being constructed extensively in the built and legislative environment, and proceeding apace. But if you have individual members who are going to be responsible for driving themselves, and who are therefore going to necessarily be the people who are responsible for doing the bulk of the charging of your vehicles, do you want them to be doing the charging during their bookings or after their bookings? Because if it’s during their bookings, then time is the biggest constraint. They’re paying while they have the car; they’re also in a hurry while they have the car. Charging infrastructure needs to be as ubiquitous, as convenient, and as trustworthy as gas stations, and with as likely a chance of finding some available, fast charging infrastructure, that’s also on your way, as it was ten years ago, fifteen years ago, to find a gas pump. If you’re responsible for charging at the end of the booking, then time isn’t as much of a big deal. It can charge between bookings, and you can just remove that car from the grid if you have to until it’s charged, if you’ve got a model that doesn’t book in advance… and even if you have a model that does book in advance, usually you’ve got multiple vehicles at the same station: there’s mechanisms. But the space is an issue, because you need a dedicated charger at a home location, or at a station, or at public infrastructure in the absence of stations. In all of these cases, it comes down to the built environment, not the shared mobility provider. Either having enough charging stations that are very, very fast, so that people are going to be able to use them as they would gas stations, or having publicly accessible charging stations even more ubiquitously, so that there’s one pretty much anywhere somebody might want to end their booking – kerbside, for example – or having dedicated charging infrastructure at the end of the booking. As long as there isn’t that extensive public infrastructure, you maintain range anxiety. People are not sure, as they book a vehicle, that it’s going to have enough fuel for their entire trip, whether that fuel is gas, or whether that fuel is simply electric charge – and so once again we’re back to the question of having enough level 3 charging structure. I’m not sure that we are going to be seeing a lot more mass adoption within the next 12 months (finally to come back to the question), simply because I’m not sure that the built environment is there yet, and increasingly I’m concerned that the built environment is zoning for personally owned EV’s rather than for shared vehicles of any type. 3. Are we constantly targeting the same user group, young professional urbanites with bachelor degrees and no family responsibilities? What are the ways we can expand on this? Well, the venture capitalists are certainly targeting the same group of people – young, professional urbanites with a bachelor degree and no family – because they are currently the easiest group of people in the transportation sector from whom to extract value and to whom to market services. And so if you’re a venture capitalist – if you’re not actually interested in serving a community except as a secondary knock-on benefit while you’re making money as fast as possible, that’s great! That’s where you want to go. That is the fastest available growth. It also makes for an awful lot of different services competing for the same user base, and it doesn’t serve the wider community. There is a difference between building up a user base and working to make transportation better throughout a community, and the thing about shared mobility – the specific type of shared mobility where you are effectively time-sharing access to a vehicle – whether that is done through actual shared ownership, or whether that’s done through simply shared access, which is rebranded rental – the more diverse your member base, the likelier they’re going to need to use those vehicles at different times, for different purposes, in different ways. And so there’s actually not just the social benefit of greater inclusivity, there’s also a financial benefit. You can use those vehicles more efficiently. You can build a better community. 4. What are the biggest challenges for MaaS to be successful? I think the single biggest thing in the way of MaaS in general, right now, is that nobody knows what it means. I’m not sure any current practitioners of mobility-as-a-service entirely agree on what it is. I’m not sure that they agree on how their specific services participate in the same mobility ecosystem. I’ve seen an awful lot of presentations from mobility-as-a-service vendors, defining the problems of mobility-as-a-service, in very particular ways, that strangely enough, their product is uniquely positioned to be able to solve. But they’re never quite the same set of problems, because nobody has quite the same set of solutions. What about the conception of success? A service has actually also got to overcome some form of barrier to transportation. So, you know, maybe the service helps pick busy you otherwise couldn’t have found out about the transportation mode, or you couldn’t otherwise have booked that transportation mode, couldn’t have bought a ticket, or you can’t physically get to the transportation mode, and so on. At some level, this means that corporate MaaS providers have an absolute need to be the software that presents a solution to a problem. Which means that they have an absolute need that there be problems, because otherwise there’s nothing for them to solve. At some point, a MaaS provider – a corporate MaaS provider that’s actually making a profit – needs to be worried about how to prevent easy transportation, and specifically how to prevent transportation from being any easier without their app than it is with it. They want their app to be the easiest method remaining. So, counter to that is the governance question. If you are representing the people – if you are representing people who simply want to get from point A to point B – or potentially from point A back to point A, having done something at point B in the meantime, a different kind of trip – then it’s exactly the opposite set of challenges. The goal now is to create transportation that is as easy as possible, so that it doesn’t look like a decision for how you’re going to get there. There aren’t an awful lot of modes right now that offer that level of flexibility, where the entire built environment – so much comes down to land use, all the time! – is structured in order to make this particular type of transportation not even look like a choice. So when you build all of the other systems, starting with public transit up and going from there, up into a mobility as a service system, you need some way of linking those transportation systems, and that goes back to land use again. That starts to look like mobility hubs, so that there is an easy method of moving from one mode to another. You need to coordinate the data – but if you’re coordinating the data from a governance perspective rather than from a capital perspective, it’s not about gathering as much data as you can, so that you can be the one who offers it, it becomes about making sure that all data providers are treated equitably, so that that the personal information of the people who are using the transportation system is also being protected. And ensuring accessibility, so that the resulting transportation system is as inclusive as possible, as diverse as possible. What you don’t want is for a few high-end transportation providers to skim off the trips with the highest profit potential, because these trips could be subsidizing everybody else, and leading to a more inclusive, larger system. And of course what I’m finally describing here is a robust public transit system. So from a governance perspective, I think that MaaS actually often ends up looking very much like public transit when it’s being done well, when it’s being done successfully. And a big challenge in the world for MaaS to be successful is going to be the conflict/tension between these two purposes: the purpose of making money, which requires that there be barriers to transportation, in order that there’s a problem to solve, and the goal of removing barriers transportation so that more people can get around better.